48,000 grains Tanks: 10"x54" each. 60,000 grains Tanks: 12" x 52" each. 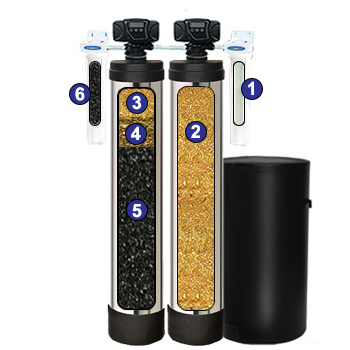 Dual Tank Water Softener and Whole House System by Crystal Quest is a Whole House application with 6 stages of filtration utilizing the advanced Eagle Redox Alloy(KDF Media) technology, combined with Granular Activated Carbon(GAC) or Coconut Shell Charcoal, Solid Carbon and a whole mineral tank of Ion Exchange resin - to provide your family with healthier skin and hair plus protection from hundreds of other contaminants. 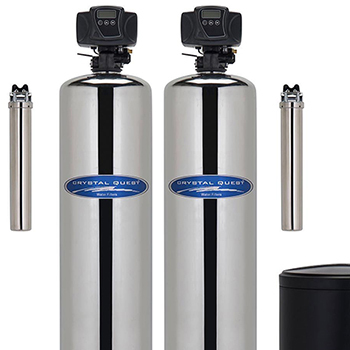 The system comes with 2 20" filter cartridge and 2 Fiber Glass(Poly Glass) w/ Stainless Steel Jacket Tanks with a brine tank that can use traditional salt(sodium) or potassium for regeneration. 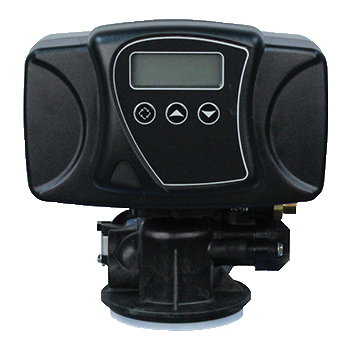 This unit has a time-initiated regeneration via an electronic controller, the Fleck Control Valve, that can be set up when softening capacity is predicted to run out. 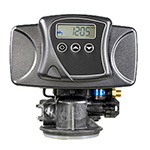 This is a self-backwashing Microprocessor Control system that automatically removes the trapped contaminants within the filter bed and washes them down the drain. 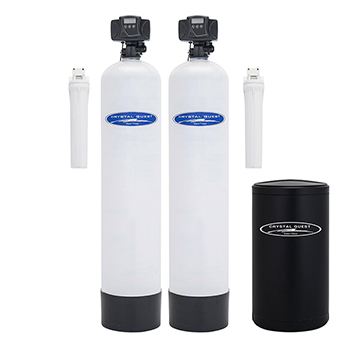 The "Automatic Backwash" feature regenerates the water softeners regularly, renewing their ability to remove hardness from water. Regeneration takes 30 minutes and will run water backwards through the system down the drain. 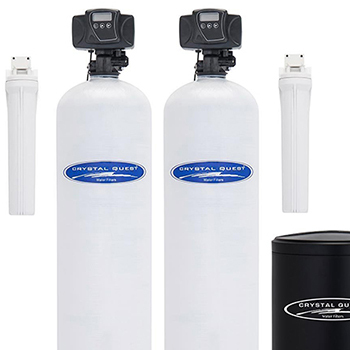 Hard water is water that has high mineral content like magnesium and calcium. Staining on your sinks, tubs, showers and clothing are major indicators for water hardness. Hard water causes a higher risk of lime scale deposits in household water systems and due to this lime scale build-up, pipes are blocked and the efficiency of hot boilers and tanks is reduced thus, increasing the cost of domestic water heating by about 15 to 20%. Household machineries such as laundry machines, solar heating systems, air conditioning units and many other water-based applications are also affected by lime scale build-ups. Water is softened or conditioned by replacing hard ions like magnesium and calcium with softer sodium or potassium ions. 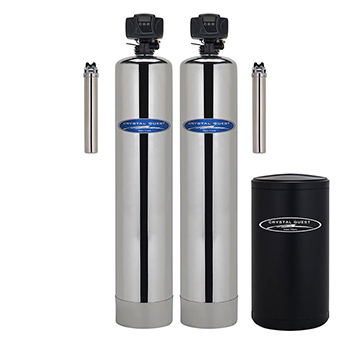 All water softeners use the same operating principle: They trade the minerals for something else, in most cases sodium. The process is called ion exchange. Reduced hard water build-up also results to cleaner dishes, easier to clean tubs, showers and sinks; softer, cleaner and longer lasting clothes. Eagle Redox Alloy media removes dissolved metals and inhibits bacterial growth. 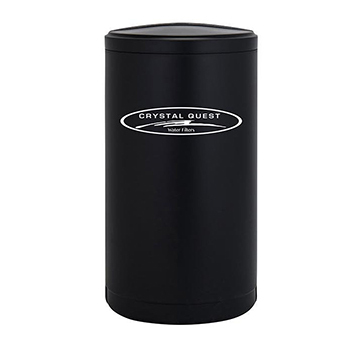 Granulated Activated Carbon(GAC) to remove odor, bad tastes and chemicals linked to cancer. Fleck 5600 automatic backwash controller with LED display. Easy to replace high capacity ion exchange resin media. Self-backwashing microprocessor - Fleck Control system that automatically removes the trapped contaminants within the filter bed and washes them down the drain. 20"x50" Brine water mineral exchange tank for media regeneration. 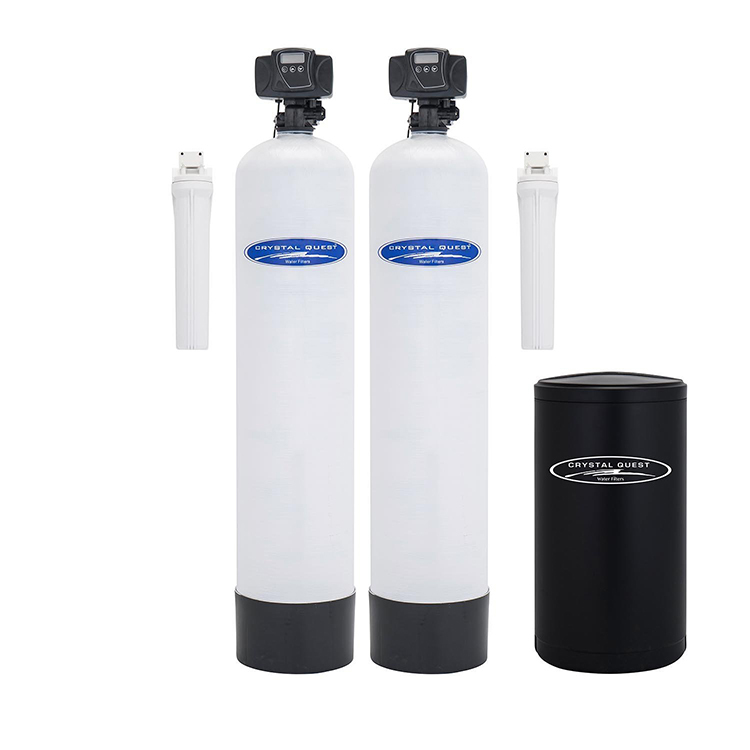 - Water Softener must be regenerated regularly, renewing their ability to remove hardness from water.